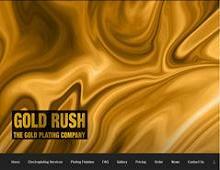 Gold Rush Plating are based in Staffordshire providing plating finishes and electroplating services nationwide. Leaders in the electroplating industry, Gold Rush Plating offer extremely high-quality finishes to metal products. The gold plating company can provide plating services to most types of metal, with finishes available in a wide variety of colours and thicknesses. In addition to their gold plating services and silver plating services, Gold Rush Plating also offer brush plating and tank plating services at their Burton-on-Trent workshop. Finding reliable gold and silver plating companies can be a hard task but you can trust Gold Rush Plating to provide superb finishes to your product every time. Are you looking for a gold plating or custom plating finish? Gold Rush Plating provide bespoke plating solutions for individuals, retail customers, commercial clients and trade customers. Contact Gold Rush for more details or a FREE quote on the electroplating services they can offer.